So what is Snowbing all about? As seen at the above photos, Snowbing brings to us Bingsu, a wonderful and ultimately addicting Korean dessert favorite, loved all over in Korea and now making waves in Manila. Bingsu is made up of thin ice shavings, then topped with your favorite flavors and toppings to give you that comforting and soothing, flavorful treat. Snowbing takes it up a notch with a combination of your favorite fruits, cream, and other delectable toppings with cream, cookies, pretzels and more. I love their Chocolate Brownie as well as their Cheesy Mango, ice sweet and blends well with other toppings. Feeling a little more adventurous? Then try out their Matcha Green Tea flavor for all those Matcha lovers out there, this is definitely up your alley. Each serving of Snowbing's bingsu is good for two (2), so take a friend along and share the goodness of Snowbing. 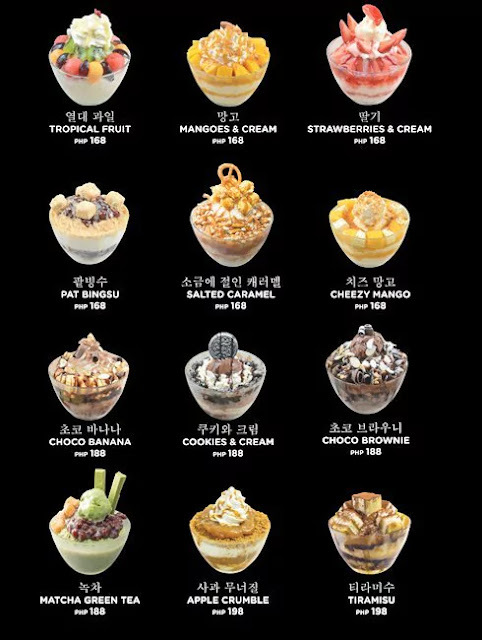 Here is the complete Snowbing menu for you to choose whatever fancies you. They also have Pizzas served by the slice with your choice of Pepperoni, Cheese, Korean and Kimchi all at only P99 each. You can also try out their toast, available in honey butter, matcha green tea, white and dark chocolate and Belgian chocolate. Enjoy the ultimate bingsu experience at Snowbing, they recently just opened in the busy malls of the North side of the metro, namely in SM City North Edsa at the G/F of the main mall and another at Trinoma. Hopefully they open at other locations of the metro to serve us more bingsu! Draw near and individual as you meet Santa's genuine reindeer. Find numerous a greater amount of his textured companions as you investigate the creature town. Advance inside Santa's boots when you visit his home with it's tremendous Christmas tree and remember to compose Santa a letter to drop in his talking post box.